Views differ as to the meaning of the phrase…’the good old days’. In this story, it means when you could buy a new car from your local dealer and later discover it had won the Mille Miglia! 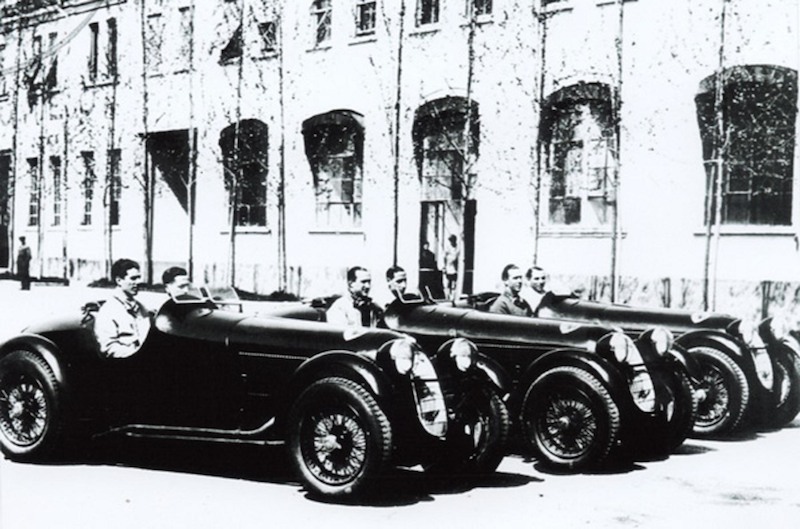 In April 1936 there were three works Alfa Romeos entered in the Mille Miglia. The three team cars were very basic with functional spider bodywork and cycle wings, and the bodies were known as the Botticella, an Italian term for cask or keg which referred to the shape of the machine, and it was meant to be a term of affection. The twin aero-screened cars were to be driven by Antonio Brivio and mechanic Carlo Ongaro, in car number 75, Farina and Meazza in number 82, and Pintacuda and Stefani in 79. 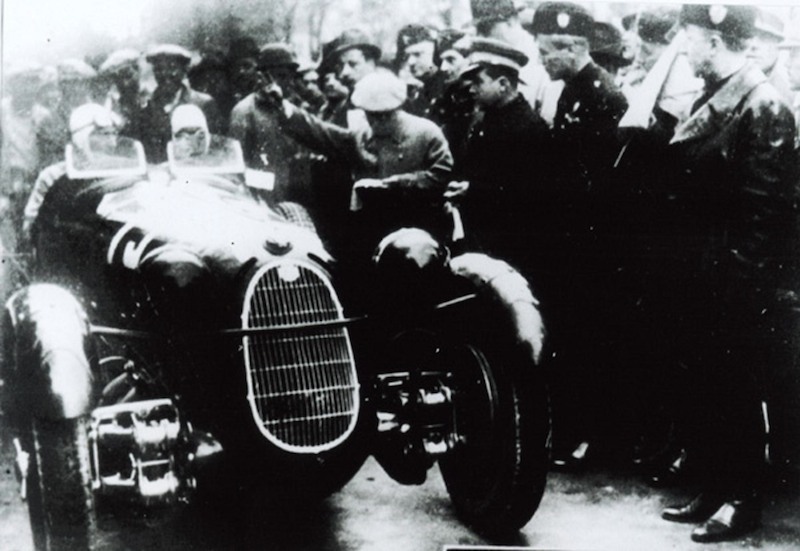 Alfas had won the 1000 mile thrash around Italy for the last four years, with Pintacuda taking victory in 1935. Though Brivio had started some minutes ahead of Pintacuda, last year’s winner had caught up with him as they went over the Futa Pass on the southward journey some miles past Bologna. 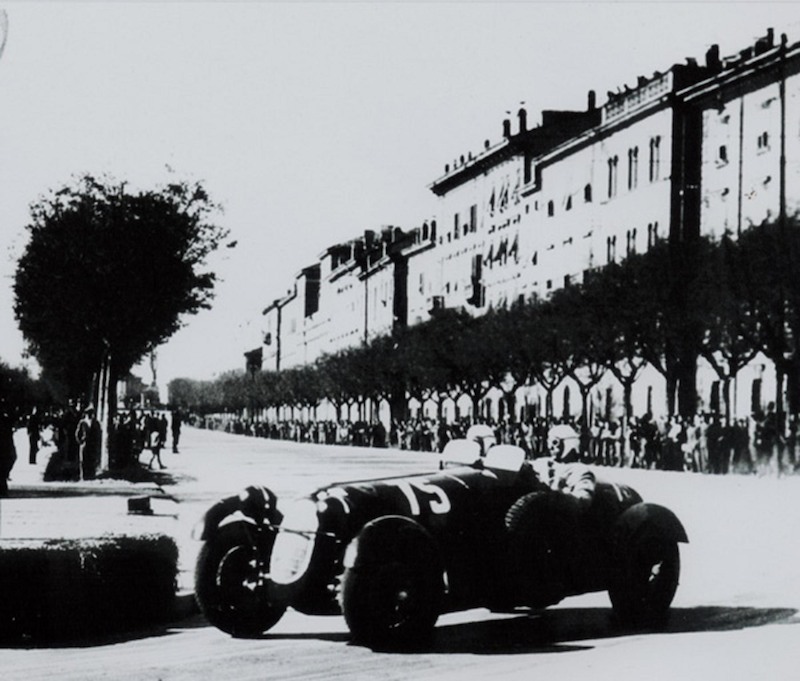 But then Pintacuda had fuel problems which caused a long delay, and by Rome, the halfway point, Biondetti in a private Alfa was ahead of the Scuderia Ferrari run works Alfas. Brivio pushed harder and harder on the northern return leg, going into the lead. Then at Peschiera, near the finish, the battery came loose and fell off. Ongaro got it back in but they had no lighting. Then Alfa Romeo driver Count Trossi, who was spectating nearby, went and got his Packard and drove behind Brivio to provide some lighting for the final miles. Brivio and Ongaro crossed the line at Brescia just thirty seconds ahead of Farina, and then came Pintacuda the same distance behind Farina…after 1000 miles. 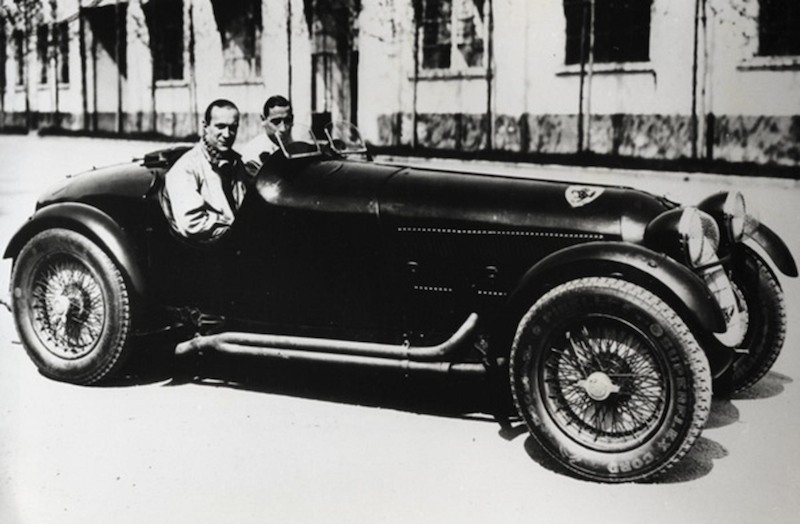 Shortly after the Mille Miglia, the three cars were rebuilt, two being sent to South America. Serial number 412004 went on to do the Spa 24 Hours with Farina and Siena driving where it was going very well until retiring in the 9th hour. Then Farina won the Freiburg Hillclimb in August. It was often difficult to identify these cars as the rules allowed them to run with or without windscreens or fenders at some events. And there was also the old tradition of swapping serial numbers round as well! Severi drove 412004 to 4th at Modena in September with no lights, no fenders and one aero-screen. As the 1936 racing season drew to a close, two cars, including one of those returned from South America, were rebodied and appeared on the Alfa Romeo stand at the Milan Auto Show in October. One of these cars was listed as 412006, and on the rear engine bearing chassis member was stamped the number 412006, with the 6 clearly stamped over a number 4. Also to be found on the engine was SF54, Scuderia Ferrari’s own number…54 was the number which had been on 412004. The car was then again re-bodied for the Paris Auto Show in November. On December 4, 1936 one Alfredo Brioschi bought this car, now listed as 412006 with a sporting, two-tone body with the Milan registration number 55316. It was sold to him as a brand new car. Ah, the good old days! Signor Brioschi retained the car for some five years, then sold it to Vittorio Roncoroni who then sold it to Jean Studer in Switzerland, who raced it and believed it to be 412006. It acquired larger superchargers, and then was sold on to Hardy Fortmann in 1947 who also raced it before moving it on to Alfred Senften, who had Martin of Berne re-body it once again with a lighter, lower spider body, circular grill and cycle wings which turned with the steering. It went to Hans Matti in 1971, then to France and the UK and into the ownership of Matt Grist and his father Paul who have restored it with a Botticella body as it was when raced in period. It’s not fair that Ed gets to drive all those vintage classics. Despite that it was a great article and photos. What a great car and a superb article/pictures. Thanks SCD and Ed McDonough! A photo shows a huge 4 spoke wheel while the article mentions a huge 3 spoke wheel, what givs? I was going thorough some old magazines of mine and came across the article you did for Vintage Racecar on the 1958 Reims event. I was wondering if you also have any recollections/photos of the 12 hour GT race? I am a builder/collector of models of cars that Dan Gurney drove in his career (80+ models built, 20 or more waiting) and I plan to build one of the #80 Ferrari 250GT TdF that he drove with Andre Guelfi at Reims. The car was severely damaged by Guelfi during the race. I have found 2 reference photos online or through online contacts and one appears to show a white stripe of undetermined size and shape, while another picture does not indicate any white at all. By any chance do you have a way to solve my dilemma? I know that you no longer post on FerrariChat, so I will also try to contact you through other means; my apologies in advance for any duplicate messages. Ed McDonough, a UK-based American has eleven motorsport history books to his credit; he has been European Editor for Vintage Racecar magazine for 15 years and has contributed to other journals. He is probably best known for track testing some of the world's best historic race cars. He started racing in the early 1960s and has competed in most categories. His recent books include "Peter Collins - All About the Boy", "Marquis De Portago - The Legend", and a history of the Alfa Romeo Tipo 33 (with Brit Peter Collins....the other one! ).